Flawless and irresistible. Carob is a passion. A fruity chocolate-like delicacy with a hint of caramel that blends perfectly with every single hazelnut. 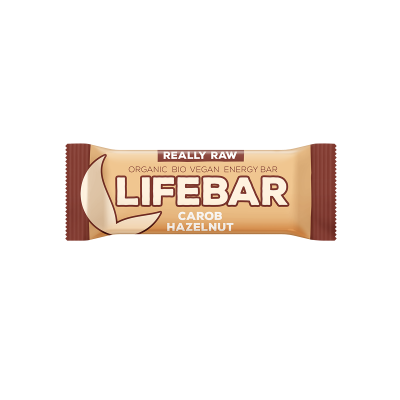 Carob is a hypoallergenic, low-fat and a caffeine-free alternative of chocolate. 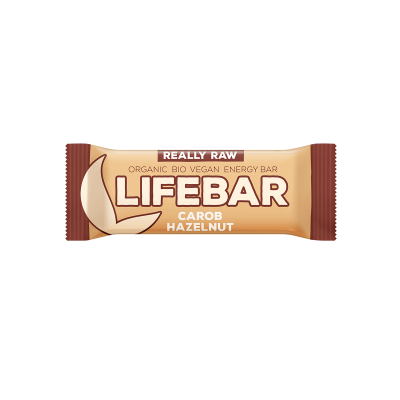 The Carob Hazelnut Lifebar raw energy bar by Lifefood is a totally indulgent energy bar. A nutty chocolate-like delicacy with a hint of vanilla that blends perfectly with the crunchy hazelnut. Carob is a low-fat and a caffeine-free alternative to chocolate. Fruits* (63 %; Dates*, Lucuma Powder*), Nuts* (31 %; Hazelnut Paste* 15 %, Hazelnuts* 8 %, Almonds*), Raw Carob Powder* (6 %), Ground Vanilla*.